May be the sound you are getting in your car is not what you expected yet the audio system looks great. So what could be the problem? Most probably, the cables that came with the car audio might need to be swapped with better RCA cables. Also, you might want to add an amplifier or subwoofer to your car for a better music experience. If this is the case, then you may have to invest in new RCA cables. Basically, RCA cables are used to carry signals from the car audio player to the amp or subwoofer or from a car amp to the subwoofer and so on. Now that the market is full of different types of RCA cables, how would you know the best type to choose? Well, we’ve got you covered. With this review, we’ve gathered the best RCA cables for car audio, thereby making it easier for you to choose. Read on for the best deals. Considering the fact that there’re dozens of RCA cables in the market, it becomes challenging to choose the best type for your car audio. We are aware of this challenge and that’s why we have come up with this review. We chose the best RCA cables for use in car audio upon doing intensive research. We gathered reports from experts dealing with RCA cables for car music systems. We also reviewed findings from existing research done on different RCA cables. In addition, we interviewed a good number of real users to find out the RCA cables they find best in their cars. From our thorough research and the reports we gathered, we were able to come up with a list of the 8 best RCA cables you would ever find for car audio. The products reviewed here are only included on the basis of facts from experts, existing research and real users. Thus, from this review, you’ll rest assured that you’re investing in the best product. Better Cables boast of being a unique hybrid RCA cable made from a combination of both silver and copper. The hybrid delivers more efficient conductivity and reduced resistance. With no doubt, this unique hybrid makes Better Cables feature in this review. The hybrid eliminates the challenges associated with pure copper or silver RCA cables. Highly flexible: Better Cables are designed to be very flexible such that they bend easily without damage to the cables and the cable cover. Their flexibility ensures that you can easily bend the cable over or around any obstacle while connecting them between car audio components. Low capacitance: In addition, another notable feature of Better Cables is that they are designed with low capacitance. Lower capacitance in RCA cables means that the cable is less likely to pick stray signal, thus it only delivers original signals, thereby making the original sound more noticeable. Stranded conductors: Most noteworthy is that Better Cables come with stranded conductors. The stranded conductors in the RCA cables comprise of many thin cables with the aim of increasing flexibility and surface area of conductivity and reducing resistance. Braided shielding: In addition, another great feature that comes with Better Cables RCA Cables is that they have 95 percent braided shielding. The shielding surrounds the cable to limit chances of signals from escaping, thereby delivering high quality signals. 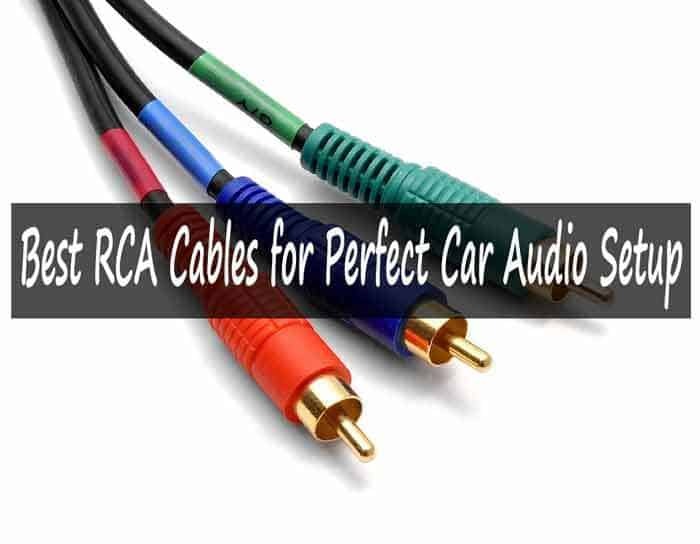 Our Verdict: If you really need an RCA cable for your car audio with high conductivity and minimal resistance, then you should add Best Cables RCA Cables in your shortlist. However, be ready to pay more for its quality features. Rockford Fosgate is one of the leading manufacturers of car audio components. The manufacturer is not left behind when it comes to RCA cables. The Rockford Fosgate Twisted Pair is outstanding for delivering a highly clean audio signal. It’s designed to minimize noise in an audio signal, thereby delivering high quality sound. Split pin: This lengthy RCA cable comes with a split center type of pin. The pin acts as a fastener that holds the cable securely in place and can be bent for fastening around objects such as screws. Copper that is free of oxygen: This RCA cable is made with oxygen free type of copper. The main benefit of this type of copper is that it resists corrosion and enhances conductivity of low frequency signals. Platinum plated cable ends: The ends of the Rockford Fosgate RCA cable are plated with platinum. The benefit of platinum plating is that it makes the ends harder, thereby making them less prone to scratching, rusting and other such surface damages. Frosted shielding: Rockford Fosgate cable comes with frosted outer shielding. The shielding reduces noise while still allowing for flexibility and enhancing the durability of the cable. Twisted pair wiring: This RCA cable is designed as a twisted pair cable and this comes with extra benefits. Twisted pair cable is effective in reducing electromagnetic radiation, interference and crosstalk between the cables, thereby delivering great sound. Our Verdict: The Rockford Fosgate Twisted Pair is ideal for anyone who wants a lengthy RCA cable that delivers quality sound without the issues of noise. However, the cable is too lengthy for car audio setup where the amp or speakers are closely set together. Looking for a lengthy RCA cable? Then checkout the Rockford Fosgate Twisted from the button below and enjoy its benefits. Hosa CMP-159 RCA cable is designed for quality and affordability. It’s actually one of the most readily available and affordable RCA cable without a compromise on the quality of sound it delivers. It’s built with hard work and high-quality, yet affordable material. Regardless of its affordability, it delivers high-quality audio signals. Connectivity to mobile devices: One of the most noteworthy features about the Hosa CMP-159 RCA cable is its ability to connect to mobile devices. This RCA cable is specially designed for connectivity to mobile devices’ audio output to an audio mixer. Nickel plated connectors: This RCA cable comes with plugs that are specially plated with nickel. Nickel plating ensures that their durability is enhanced while allowing for efficient conductivity of audio signals. Copper conductors that are free of oxygen: This cable consists of copper conductors that have been treated to ensure they are oxygen-free. The key purpose of this kind of treatment is to ensure the RCA cables are more efficient at conducting audio signals. Bends easily: This RCA cable has a very sturdy build yet it bends easily. Despite having a sturdy build, the cable is not stiff such that it bends easily around corners and objects. Very affordable: This RCA cable outshines many other options when it comes to affordability. It’s extremely affordable for its quality. Our Verdict: The Hosa CMP-159 RCA cable is ideal for anyone looking for a quality, yet extremely affordable car audio RCA cable. However, it demands more care when handling and is not ideal for use in high traffic areas. Grab this incredibly affordable Hosa CMP-159 RCA cable on Amazon while stocks last. Mediabridge 3.5mm is a single-male to two-male RCA adapter that is specially designed to connect mobile devices to a car audio system. It’s actually one of the best RCA cables for car audio that you can ever find. With this RCA cable, you can connect your portable device to your car audio receiver, amplifier or speakers. Thus, you can easily bring your mobile music to your car with this RCA cable. Step-down type of design: This RCA cable is specially built to have a step-down kind of design. The purpose of this design is to ensure the plugs are connected to both your mobile music device and the car audio system firmly. Dual shielding: The Mediabridge 3.5mm is built with dual shielding unlike most RCA cables that have just a single shielding. Dual shielding makes the RCA cable less prone to electromagnetic interference from outside power sources, thereby delivering a clean signal. Polished metallic connectors: The RCA cable has specially polished jack connectors. Polished connectors are less prone to corrosion and give them a shiny, attractive finishing. Gold-plated connectors: This RCA cable comes with 3.5mm gold plated jacks. Gold plating eliminates the problem of oxidation, thereby making the cable less prone to corrosion. Flexible jacket: Mediabridge 3.5mm RCA cable is extremely strong, yet it has a very flexible jacket. The flexible jacket makes it easy to pass the cable through tight spaces without damage to the conductors and shielding. Our Verdict: Mediabridge 3.5mm RCA cable is ideal for anyone who wants to bring their mobile device music to their car and enjoy tight connections. However, remember that this cable can only get a signal from a 3.5mm jack. Why not get this affordable Mediabridge 3.5mm on amazon right away and be part of other car owners enjoying its multiple benefits. The Audioquest Evergreen RCA cable has not been left behind by competing brands. This RCA cable stands out base a special type of air-filled insulation to keep the conductors protected from losing signals. This kind of shielding also ensures that the audio signals are not affected by external energy sources. Polyethylene foam insulation: The two, solid copper conductors of this RCA cable are insulated with a polyethylene foam. The foam is filled with air whose purpose is to ensure the conductors are insulated against absorbing external energy such as electromagnetic energy and radio frequencies. Long grain and solid copper wire: Audioquest Evergreen RCA cable is specially designed with long grain and solid copper wire. This type of copper comes with fewer oxides than standard copper, is less impure and has fewer grain boundaries, thereby enhancing its conductivity. Connectivity to mobile devices: The cable comes with a male 3.5mm jack and two male RCA outputs for car stereo speakers or amp. You can simply plug in the 3.5mm jack to any mobile devices that has a 3.5mm audio port such as a mobile phone, laptop or music player. Gold plated connectors: This 3.5mm to RCA cable comes with gold plated plugs that are cold welded. Gold is hardly prone to oxidation such that the plugs are less prone to corrosion while cold welding creates smooth and strong joints. Metallic noise dissipation: The Audioquest Evergreen RCA cable features a noise dissipation system made of a metallic layer. This kind of noise dissipation technique keeps external radio frequencies away such that the cable delivers a signal free from noise. Our Verdict: The Audioquest Evergreen RCA cable is ideal for anyone who wants to eliminate the issue of noise in lower quality cables. It’s specially designed for quality sound but its tight fit is not ideal for frequent plugging and unplugging. Why not check out more reviews for the Audioquest Evergreen RCA cable on amazon and get it right away! KabelDirekt RCA cable stands out as a two channel cable that delivers quality audio signal for the right and left audio channels. It’s ideal for connecting signals from any car audio receiver to the speakers or amplifier. Moreover, it is designed for affordability. Double shielded conductors: The KabelDirekt RCA cable is built with copper conductors that are double shielded. Double shielding enhances the ability of the cable to keep off electromagnetic and radio frequency interference, thereby delivering a cleaner signal. Oxygen free copper: The core conductor of this cable comprises of specially treated oxygen free copper. This type of copper has the ability to transfer low frequency audio signals and allows for more conductivity than standard copper. Two male to two male plugs: This RCA cable comes with two male plugs on either ends. The benefit is that the cable is bidirectional such that you can connect it either way to any standard output that has the left and right outputs. Gold plated plugs: The cable comes with high quality, gold plated plugs. Gold plating adds protection to the connectors such that they are less susceptible to corrosion. Available in six sizes: With this brand, you can choose between six different sizes as needed, including 3, 6, 10, 15, 20 and 25 feet. This way, you can choose the length that fits your car audio system setup. Our Verdict: If you are searching for a quality, yet affordable RCA cable that can connect your car audio receiver or stereo to a speaker or amp, then you should add the KabelDirekt RCA cable in your shortlist. However, the connectors may slip off easily in high traffic areas but are ideal for plugging in and out often without any issue. Need a really affordable yet high-performance RCA cable? Then check out the KabelDirekt RCA cable right on amazon while stock lasts. AmazonBasics RCA cable is built to connect either high or low frequencies. For instance, you can use it to connect to a low frequency car subwoofer or a high frequency car stereo. Since it comes with two male to two male connectors, its ideal for any HiFi car stereo with either left or right channels. Gold plated plugs: This cable features metallic gold plated plugs. Gold plating allows for enhanced resistance to corrosion since it is hard to oxidize a gold plated surface. Colored plugs: The connectors are marked in red and white color on either ends. The benefit of the colored markings on the connectors is to allow for easy and appropriate connection. Specially shielded: AmazonBasics RCA cable is shielded appropriately. The shielding eliminates noise in the signal, thereby allowing for transmission of clear audio. Accepts both low and high frequency signals: The cable connects to low frequencytype of audio signals such as a car subwoofer and high frequency such as digital car stereo. Our Verdict: Car owners looking for an RCA cable that can connect to both low and high frequencies should consider the AmazonBasics RCA cable. It fits just right into RCA ports but may not fit in extremely tight spots. Why not visit amazon for a great deal on AmazonBasics RCA cable and enjoy its benefits. Ugreen 3.5mm is specially built to connect mobile devices with 3.5mm jack support such as tablets, mobile phones, music players and laptops to a car audio player. You simply connect the Ugreen 3.5mm jack to your portable device and connect the RCA connectors into your car audio receiver or amplifier. Gold plated plugs: Ugreen 3.5mm comes with one gold plated 3.5mm jack and two gold plated RCA connectors. Gold plating enhances their durability while still making the plugs less prone to issues of corrosion. Oxygen free conductors: The cable is built with oxygen free copper conductors. This type of copper allows for enhanced conductivity. Connectivity to mobile devices: This cable comes with a 3.5mm jack which connects to mobile devices with 3.5mm audio port. The benefit is that you are able to play music from your mobile devices to your car audio. Slim 3.5mm jack: The Ugreen RCA cable comes with a slim 3.5mm jack. Its slim nature allows for effortless connection even with mobile devices that have thick protection covers. Soft jacket: The outer cover of this cable is made of a soft PVC cover. Its soft nature makes it flexible while still protecting the cable from damage. Our Verdict: If you have tried other 3.5mm to RCA cables and failed to fit well in your mobile device, then you should try Ugreen 3.55mm to RCA cable. It fits snugly into any mobile device even if it has a thick protective cover. However, it may get damaged sooner if moved or twisted constantly. Why look any further if you need an affordable 3.5mm to RCA cable? Grab this Ugreen 3.5mm from the button below. Generally, RCA cables consist of a conductor that carries signals from one car audio device to another. You will be using the cable alongside other electronic components and wires in your car. This means that the signal carried in the RCA cables will also run along other signals or electric energy passing through other wires. Such external signals can interfere with the audio signal carried in your car audio RCA cable such that the delivered signal may be distorted or noisy. To prevent this from happening, the RCA cable should have effective shielding. Thus, you should consider choosing a cable that is shielded against noise and electromagnetic interferences. The shielding should also protect the cable from external radio frequencies.In case the shielding used is extremely thin, your signal will suffer some loss in energy or gain external noise. Thus, consider a cable with thicker shielding, or better double shielding. Avoid cutting corners when it comes to shielding. Both sides of RCA cables have connectors. Some have one male 3.5mm jack pin to two RCA and others have two male to two male RCA. Whichever connector configuration you want, you should consider connectors that are sturdy enough to last longer. Thicker RCA connectors are more ideal for they give a tight connection for a car head unit or mobile device to the car amplifier or subwoofer. When comparing different RCA cables, consider the ones that tend to have thicker connectors for they would give better contact than thinner ones. Thinner connectors tend to loosen up and lose contact. Tighter contact allows for better conductivity, thereby the quality of signal delivered is higher. Also, a tighter connection reduces noise at the point of contact. Different brands of RCA cables use different standards and types of conductors. However, most RCA cables are made using copper as the core conductor. Copper is more suitable for transferring audio signals. Nevertheless, copper comes in different standards. Some RCA cables use copper in its standard form while others use specially treated copper or copper mixed with other metals such as silver. Specially treated copper, such as copper which is free of oxygen, proves to be a better conductor than standard copper. Thus, consider RCA cables with specially treated copper conductors for enhanced conductivity. It’s obviously good to consider the cost of RCA cables before making a purchase. However, never compromise quality of the cable over cost. You should not really overpay, but the cost should match with the quality of the cable. Always go for a car audio RCA cable with the highest quality even if it means adding some few dollars. Thus, as you weigh your budget, consider the quality of what you are investing in to get the best deal. RCA cables for car audio come in different lengths. The cable you choose should have sufficient length based on your car audio system and speaker setup. Thus, before choosing an RCA cable, determine how far your car amp or subwoofer is from the audio receiver. Upon reading through this review, it’s clear that each and every RCA cable for car audio reviewed here comes with its own unique features. While some features are common between different RCA cables, each cable comes with an outstanding feature. Also, these cables come with multiple benefits and some few shortcomings. Thus, each and every RCA cable reviewed here is worthy enough for consideration in your shortlist. If you need a cable to connect your mobile device to your car audio, there’re great choices listed here. Also, if you need an RCA cable to connect your car audio to the car amp, you’ll also find great choices here. Most noteworthy, your choice should be based on overall quality of the cable by considering factors such as the type of shielding, type of conductor, cost, length and sturdiness of the connectors. With these tips in mind, you will rest assured of getting the best RCA cables for car audio on, all at great prices.